The Global Volcanism Program has no activity reports for Hankow Reef. The Global Volcanism Program has no Weekly Reports available for Hankow Reef. The Global Volcanism Program has no Bulletin Reports available for Hankow Reef. Oral tradition suggests the possible existence of a now-submerged volcano off the coast of Papua New Guinea. Accounts from many villages along Madang coast report that residents fled from Yomba Island 8-10 generations ago when the island was destroyed by an eruption accompanied by a tsunami. The location of the former island is uncertain, but most informants placed it in the vicinity of the present-day Hankow Reef (Mennis, 1981), between Bagabag and Crown Islands, NW of Long Island. Binns et al. (2002) surveyed the area, locating two distinct seamounts as well as a caldera SW of the reef; they found no evidence for the existence of the legendary Yomba volcano. Mennis M R, 1981. Yomba Island: real or mythical volcano?. Geol Surv Papua New Guinea Mem, 10: 95-100. Mennis M R, 2005. Yomba Island (Hankow Reef), Atlantis of the South Pacific. unpublished manuscript, 40 p.
The Global Volcanism Program is not aware of any Holocene eruptions from Hankow Reef. If this volcano has had large eruptions (VEI >= 4) prior to 10,000 years ago, information might be found on the Hankow Reef page in the LaMEVE (Large Magnitude Explosive Volcanic Eruptions) database, a part of the Volcano Global Risk Identification and Analysis Project (VOGRIPA). There is no Deformation History data available for Hankow Reef. There is no Emissions History data available for Hankow Reef. 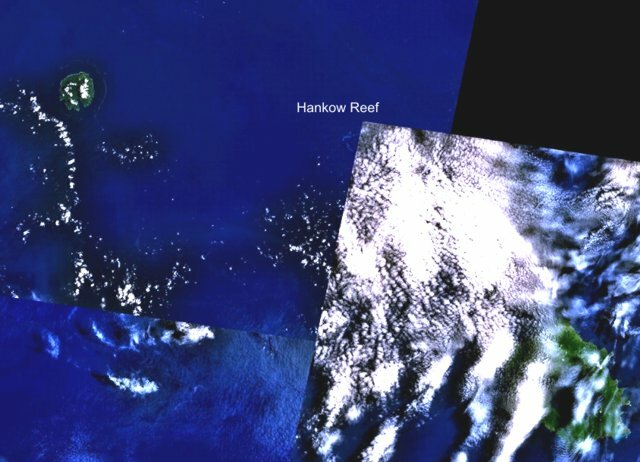 Hankow Reef is partially truncated just below the upper left corner of the cloud-covered portion of this NASA Landsat composite image (with north to the top). The possible existence of a now-submerged volcano named Yomba off the coast of Papua New Guinea is inferred from oral tradition and is considered to likely be at the location of Hankow Reef. The reef lies SE of Bagabag Island (upper left) and NW of Long Island, the larger island at the lower right. Crown Island lies beneath the cloud cover between Long Island and Hankow Reef. There are no samples for Hankow Reef in the Smithsonian's NMNH Department of Mineral Sciences Rock and Ore collection. IRIS seismic stations/networks Incorporated Research Institutions for Seismology (IRIS) Data Services map showing the location of seismic stations from all available networks (permanent or temporary) within a radius of 0.18° (about 20 km at mid-latitudes) from the given location of Hankow Reef. Users can customize a variety of filters and options in the left panel. Note that if there are no stations are known the map will default to show the entire world with a "No data matched request" error notice. Large Eruptions of Hankow Reef Information about large Quaternary eruptions (VEI >= 4) is cataloged in the Large Magnitude Explosive Volcanic Eruptions (LaMEVE) database of the Volcano Global Risk Identification and Analysis Project (VOGRIPA).